Pruitt’s deregulations won’t hold up in court. He may be one of the most effective Cabinet members right now, but that may change when his legal shortcuts are litigated. 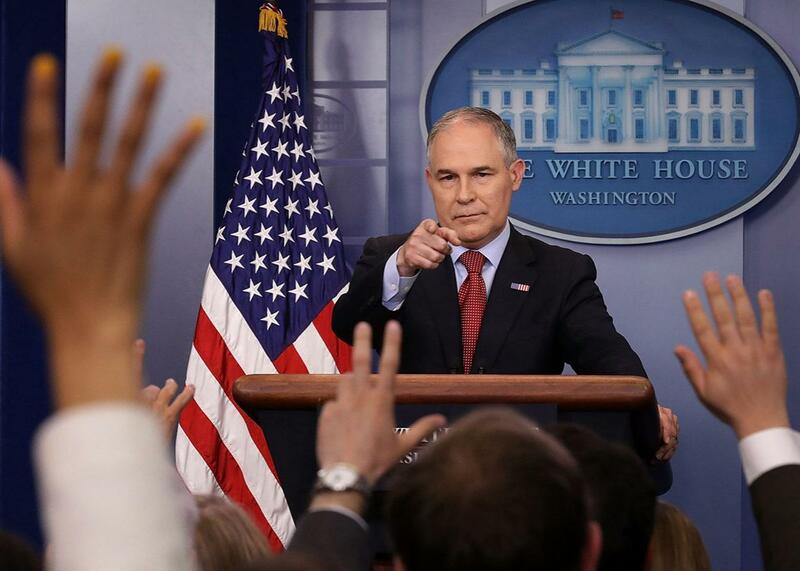 Environmental Protection Agency Administrator Scott Pruitt answers reporters’ questions during a briefing at the White House on June 2. Say what you want about this administration’s competence, but there’s one area where they are succeeding for now: Scott Pruitt has been the Environmental Protection Agency’s administrator for a short five months and already he has speedily and forcefully upended an unprecedented number of environmental rules, earning a reputation as one of the few Cabinet members to effectively move Trump’s deregulatory agenda forward. Pruitt claims that these regulatory rollbacks represent a return to the “rule of law,” but he has pursued them in a lawless fashion, cutting corners and ignoring fundamental legal requirements. Now, failing to follow the rules of the game is catching up with him—his EPA recently suffered its first courtroom defeat, kicking off what is likely to be a long losing streak and creating regulatory uncertainty along the way. On July 3, the U.S. Court of Appeals for the District of Columbia Circuit—the court that will hear many of the challenges to the EPA’s onslaught of rollbacks—nixed Pruitt’s attempt to delay a rule limiting methane leaks at oil and gas facilities. The rule would require companies to plug methane leaks, which would help recover valuable natural gas as well as help clean up the air. But at the request of industry, Pruitt decided to suspend the rule’s compliance deadlines. To justify the delay, he relied on a section of the Clean Air Act that allows the EPA to temporarily suspend a rule while considering objections that could not have been raised prior to the rule’s issuance. Pruitt claimed that this standard was met, but the court found his claim to be obviously false: Not only could the objections have been raised earlier, but they were in fact raised by industry before the rule was finalized. Strike one for Pruitt. Pruitt’s other repeal efforts are full of similarly questionable moves. Some of these actions have already been challenged in court; other suits are likely to follow. For example, the Administrative Procedure Act requires EPA to seek and respond to public input before taking major deregulatory steps. But Pruitt has been attempting to bypass that requirement by suspending rules indefinitely without public comment. Both the Clean Air Act and the Administrative Procedure Act allow Pruitt to suspend rules only before they become operative. Once a rule goes into effect, compliance deadlines cannot be suspended without a public revision process. (This system provides needed certainty and predictability to the industries these rules affect, since facilities may need time to prepare for compliance and also want to know that the rules will not suddenly shift underfoot while they prepare.) Pruitt has paid no attention to these issues and has suspended compliance deadlines for several rules—including the toxic water pollution rule and a rule limiting methane emissions from landfills—long after those rules were effective. Under the Administrative Procedure Act, the EPA also must give good reasons for suspending or repealing a regulation at the time that decision is finalized. But Pruitt recently blew off this requirement when he indefinitely suspended the compliance deadlines in a regulation seeking to improve safety at facilities that deal in dangerous and explosive chemicals. He provided no reasons for the change beyond the fact that the EPA was considering repealing the rule at some unspecified point in the future. But federal agencies are not authorized to suspend rules first and figure out their reasons later. They are supposed to give their reasons so that the public can comment on them before a deregulatory move. The EPA must weigh the costs and benefits of any decision to cancel public health or environmental protections. Instead, Pruitt has been using a variety of excuses to ignore the lost health and environmental benefits that result from his rollbacks. For example, in a recent proposal to suspend a Clean Air Act rule, the EPA stated that information about the forgone benefits of the rule is “currently unavailable”—despite the fact that the details of the original rule’s benefits were published just last year and remain available to all. In a proposal to repeal a major Clean Water Act rule, the EPA claimed that a large category of benefits can no longer be quantified because the data that the agency originally relied on was published before 2000. But data that was just as old was fine when it came to calculating the cost savings of the proposed repeal. And in suspending the compliance deadlines in the rule updating safety measures at chemical facilities, the EPA absurdly claimed that the benefits of the rule will “not be impacted” despite the indefinite delay of safety improvements that will help reduce danger to police and firefighters responding to chemical disasters. Pruitt’s willingness to play fast and loose has helped his anti-regulatory reputation soar. But the brazen deficiencies in the agency’s work exposing the hollowness of Pruitt’s “rule of law” rhetoric should give Pruitt’s supporters pause. Once the judicial challenges run their course, Pruitt may be striking out a lot more.